50 cent finds – a thing of the past? Avengers Annual #9 (Marvel, 1979): A pretty beat up copy, but it featured Don Newton art in one of his few Marvel assignments. I really love how busy the cover is, and the original Avengers logo seems really appropriate to me. Little Archie #117, 139,141, 145, 150 (Archie Comics, 1977-1980): Okay, so maybe I am still collecting some things for collecting’s sake … no apologies, because I find Dexter Taylor’s clean yet bold cartooning a joy to look at. And if I get a few Bob Bolling stories in there, all the better! 1st Folio #1 (Pacific Comics, 1984): a collection of work from students of the Joe Kubert School. This issue included work from Joe, Andy & Adam Kubert, and Ron Randall. Like with DC’s New Talent Showcase (#6, 1984), it’s often instructive– or entertaining– to look at early work from pros who went on to careers of their own, such as Steve Lightle, Gary Martin, Chris Carlson, Karl Kesel, and Steven DeStephano. Green Lantern #76 (DC, 1992 Silver Age Classics reprint): for all the times this issue has been reprinted (and excerpted in mainstream articles about “relevant” comics), I don’t think I’ve ever read it before. 47 years on, it’s hard for me to fully appreciate the impact that issue had– either in light of GL #75, other comics on the stands, or even the news of the day– but it holds up pretty well. Marvel Classic Comics #2 (Marvel, 1976): I love the ad-free literary adaptations Marvel published in this series, even if the interiors (in this case Otto Binder and Alex Nino, no slouches in their own rights, adapting H.G. Wells’ The Time Machine) didn’t live up to the exciting Gil Kane covers. The ‘Nam #1 (Marvel, 1986): for the most part, I’m consciously not replacing comics I shed before my move to Memphis, but this issue by Doug Murray and Michael Golden is such a great issue I grabbed a new copy for myself. I doubt I’ll replace any more issues, but Golden’s mix of cartooniness and realism is on fine display here. Mister Miracle #19-25 (DC, 1977-78): Not Kirby issues, but the later revival by Steve Englehart, Marshall Rogers, Steve Gerber, and Michael Golden. I’ve got a lot of good reading ahead in those issues! Avengers Prime #1 (Marvel, 2010): someday I’ll learn to not pick up Bendis comics, even at bargain prices! Not even an artist of Alan Davis’ skill can make me enjoy Bendis’ unnecessarily over-dialogued panels. Ten word balloons in one panel? Ridiculous. Smax #1-5 (America’s Best Comics, 2003-2004): I’ve never read this Alan Moore/Zander Cannon spin-off from their Top 10 series, but since the whole run was right there, I snatched it up. For less than the cover price of a single new monthly, even! Airboy #1 (Eclipse, 1986): I have a real interest in 16-page comics (like this, The New Wave, and Skeleton Key), since that’s the format I often publish in. Writer Chuck Dixon and artists Tim Truman & Tom Yeates put together a good-looking comic, but paced it too slowly for my tastes. Even though published as a bi-weekly, it didn’t get far enough into the origin to compel me to keep reading. But for good or bad, my favorite find may just be Jigsaw #1 (Harvey Comics, 1966). I have no knowledge of “the man of a thousand parts” except that he was featured in Jon Morris‘ The League of Regrettable Superheroes … which is all the endorsement I need to read that comic! It’s been a while since I’ve written about my bargain bin finds– a while since I’ve rummaged through bargain boxes at all, in fact– so I was thrilled to stumble upon the “50¢ Island” during last weekend’s grand opening of 901 Comics on Young Avenue in Memphis. In addition to a healthy supply of bargain reads, they stock a pretty respectable number of back issues, including signed comics and new and used trades. New single issue selection was still a little sparse, but for a store that hasn’t even been open a full month yet, that’s not surprising. Super Goof #43 (Whitman, 1977): Not only did it have a fantastic cover cameo by Donald Duck, but it was also an issue I didn’t have! Love and Capes #7 (Maerkle Press, 2008): I enjoy Thom Zahler’s “heroically super situation comedy”, and this issue (a FCBD offering) also gave me a peek at how he markets and monetizes his webcomic with ancillary merchandise. Marvel Saga #1 (Marvel, 1985): I had never read an issue of this cut-and-paste retelling of Marvel’s continuity, but for half a buck I figured it was worth a try. An interesting primer, but I thought it came off really dry, with none of the excitement of the original stories. Had they done this 15-20 years later, when they could have used digital lettering instead of typesetting, and actually taken the time to lay the cut-and-paste images into full pages of comic art, I think it would have worked much better. Cosmic Capers (Big Muddy Comics, 1972): One of the things I was hoping to stumble upon when I shifted my location so far from Kansas were different locally-published comics. This underground gem from New Orleans has a flavor all its own that certainly fits the bill! Tales from the Tube #1 (Print Mint, 1973): The find of the day! Surfing-themed comics from Rick Griffin, S. Clay Wilson, Robt. Williams, Crumb, and other underground legends! Wildstar #1 (Image, 1993): While I’m not a big fan of the blood-drenched superhero vibe of the early Image comics, it’s got Jerry Ordway art! That alone makes it worth a read! Rip in Time #1 (Fantagor Press, 1986): Bruce Jones and Richard Corben– definitely worth a look at that price! The Age of the Sentry #1 (Marvel, 2008): Luckily, it was written by Jeff Parker & Paul Tobin (not Bendis! 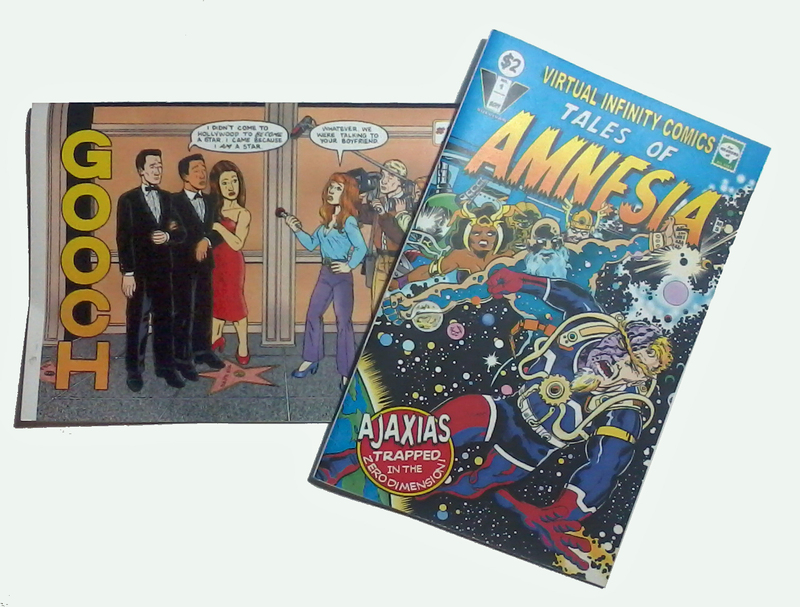 ), and the art by Nick Dragotta and Ramon Rosanas is fresh and fun to view. Thank goodness for Image and the independent publishers who have made good use of genres ignored as DC and Marvel became so superhero-centric over the years since then. I can’t recall when I first discovered the art of Peter Kuper (probably an early ’90s issue of World War 3 Illustrated or his adaptation of The Jungle), but I was immediately drawn to both his graphic style– a combination of scratchboard and stencils– and his sharp political commentary. I’ve enjoyed his work ever since, and his ability to convey a story with few (or often no) words made him a natural fit for Mad magazine’s “Spy vs. Spy”, a strip he’s drawn for nearly 20 years. So, naturally, I was predisposed to enjoy his latest book, Ruins (Self-Made Hero, 2015). What surprised me, though, were the nuanced characterizations of his protagonists, New Yorkers Samantha and George. They are not merely ciphers, but fully realized characters. The story details their time spent during Samantha’s sabbatical year in Oaxaca, Mexico, their strained relationship, and the violent suppression of the local teachers’ trade union strike there in 2006. 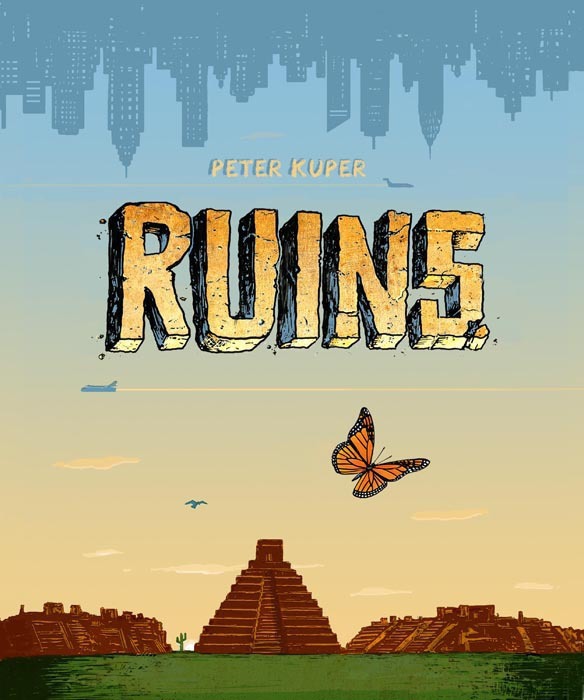 Their story is paired with the migration of a monarch butterfly from New York to Oaxaca, which gives Kuper a chance to touch upon additional issues of social and ecological damage. He has a lot to say in this book and he says is well. It’s an engrossing read, and he brings an admirable mix of illustration styles to its pages. It may well be my favorite work by him yet, and he takes full advantage of the scope of his vision. In addition to the mix of illustration styles, Kuper also gives each of his main characters a distinctive speech bubble and lettering style that mirrors their personality. This technique, which too often comes off as a distracting trick, works well here, likely due to the mix of drawing styles already at play in the book. David Mazzucchelli did something similar in his Eisner and Harvey Award-winning book Asterios Polyp (Pantheon, 2009), another highly recommended read that is both a visual treat and an intriguing character study. In fact, one of the Eisners it won in 2010 was for his lettering. So why, then, does this technique bother me so much when I encounter it in mainstream comics? I’m thinking particularly of the lettering in Marvel’s Avengers and Fantastic Four circa 1998 (the “Heroes Return” era): Thor had a Norse-evoking typeface, the Human Torch had a flaming speech bubble with red type, and the Thing spoke in chunky letterforms. Looking back on it in comparison to Ruins and Asterios Polyp, perhaps I found it such a distraction because they were applying such different speech lettering when there was not an accompanying variety of artwork within the story. Or perhaps it just turned me off because it became obvious that hand lettering had been cast out, and such tricks as transparent bubbles with gray type came to be used for “whisper”, instead of the dashed bubbles that had been its clearly-recognized sign for decades. Even though tricks like that, and the often-used choice to letter with a smaller type size rather than letter around the artwork, often caused readability to suffer as a result. But perhaps I’m being too hard on the Comicraft letterers making those early forays into digital lettering: after all, it wasn’t too many years later that Todd Klein proved one could produce subtle digital lettering in books like Tom Strong and Promethea. It just serves as a reminder to cartoonists at all levels that proper lettering is a skill that takes more attention to detail than simple typesetting. I’ve employed digital lettering in my own comics over the years, but found myself tweaking it a fair amount in the production stage to get the look I want. Currently I’m hand lettering most of my comics again, and I’m enjoying taking the time to reacquaint myself with that process … which actually means less time spent cleaning scans and doing production, and more time drawing, which is a great tradeoff any day of the week! When I moved to Memphis last year, I knew I’d be moving into a smaller space and that I had to pare my “stuff” down. A lot. That meant not only books, clothes, and CDs … but comics, too. Over the last few years, I had regularly been shedding comics I’d read (and may or may not have enjoyed reading) but didn’t want to keep in my collection. This time, though, was different. I also got rid of comics I’d liked. Comics I had actively collected. Comics I’d held on to for decades in some cases. Comics that were sometimes hard to let go of. Champions (Marvel, 1975-1978) was one of my favorite superteam comics, featuring an oddball mix of heroes (even for 1970s Marvel! ): Angel, Black Widow, Ghost Rider, Hercules, and Iceman. I discovered it nearly on the eve of its cancellation, and loved tracking down their appearances, especially the Mantlo/Byrne issues that came at the end of its run. It all went (partly because I hadn’t read them in years, partly because Marvel collected them as a trade a few years ago) … except for the Godzilla crossover issue, which is less likely to see print again. I’ve been thinking a lot about the differences between comic strips and comic books lately. But I’m enjoying what I’m discovering– not just in classic adventure strips that lean naturally toward my comic interests– but also in gag strips, both those being published today and what I’m rediscovering in older strips. A Chum Bucket of fun! 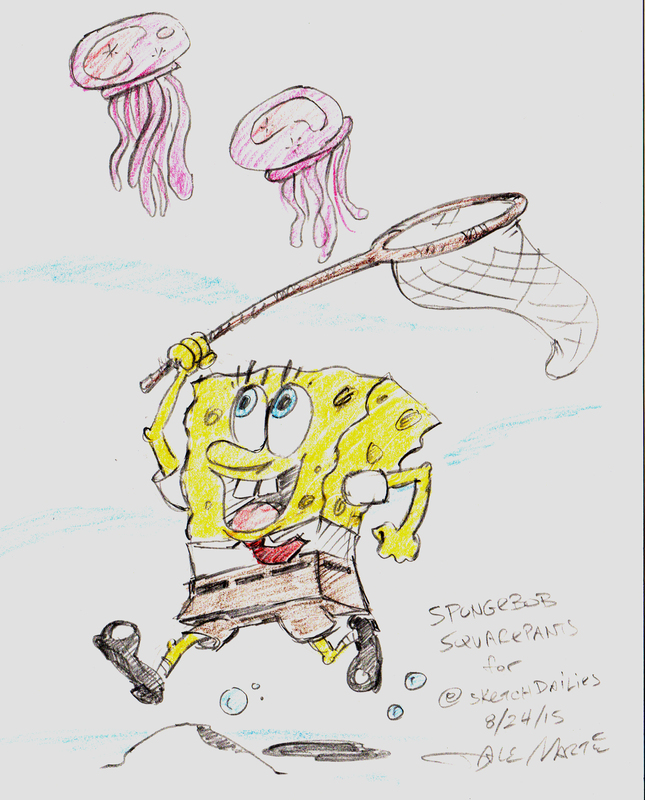 As it celebrates its 50th issue, I thought I would take a moment to share my love for one of the only two titles left on my pull list– SpongeBob Comics! Now, I’ve never watched the SpongeBob SquarePants show, so my knowledge of– and unbridled pleasure in– these characters comes solely from the pages of the comic. And I enjoy them so much that at this point I’ve been hesitant to watch the show (or even the movies) for fear it will sour my perception of the characters. Each issue never fails to bring me an honest laugh– more laughs than a month worth of the snarky asides meant to pass as humor in today’s superhero comics– genuine humor that come from the normal interactions between these characters. Page for page, it gives me more laughter and pure joy than even well-done issues of Simpsons Comics and Futurama Comics, other tv tie-ins that work well on their own as comics. The fact that protagonists SpongeBob and Patrick are clueless idiots who persevere despite that shortcoming helps, of course (it must be a favorite character trait of mine, since I’ve used it with my own long-running protagonists (TGWAH!, Watusi) over the years). SpongeBob Comics regularly features puzzles, interactive strips and stories with complex (though easy to follow) game-like page layouts among the more straightforward and goofily humorous stories. They’ve maintained a steady group of creators over the run, including James Kochalka, Mark Martin, Jacob Chabot, Graham Annable and others that make each issue a treat! I may not know who or what will be in each new issue, but it never lets me down! 1940 was a banner year for the introduction of long-lived comic book characters: the Spirit, the Flash, Robin, the Joker, Hawkman & Hawkgirl, Green Lantern, the Justice Society of America, and many more first appeared in that year. This year has already seen 75th anniversary celebrations for a number of them, including my personal favorite: the original Captain Marvel! 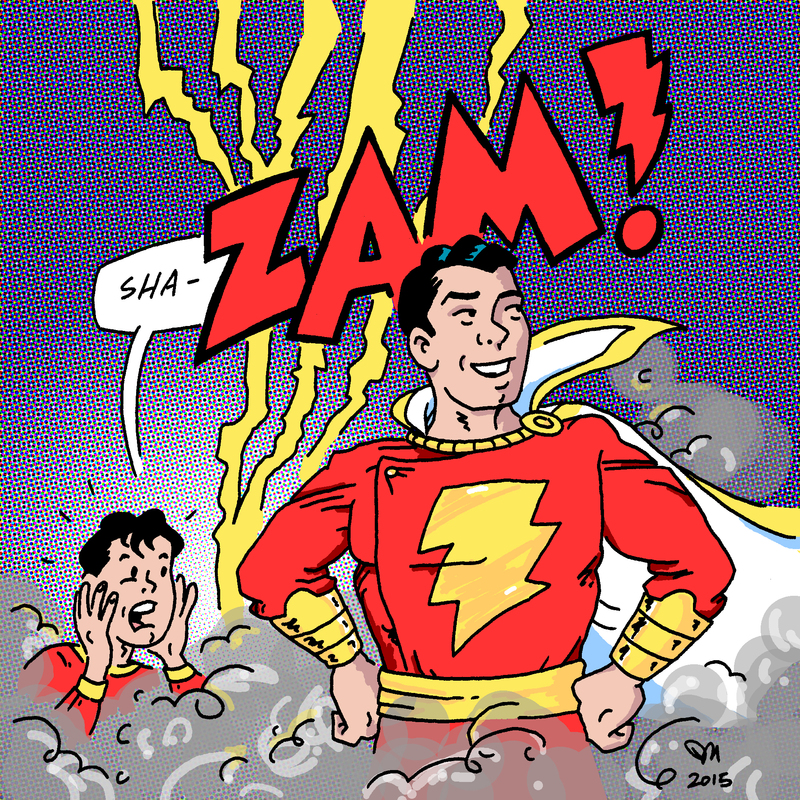 It’s been a pretty good year for the good Captain, beginning with Grant Morrison & Cameron Stewart‘s Thunderworld Adventures (featuring nicely updated Marvels in the standout chapter of Morrison’s Multiversity miniseries) and culminating with the recent Convergence: Shazam! two-parter pitting the Marvel Family against the Gotham by Gaslight Batman. Jeff Parker and Evan “Doc” Shaner really knocked the ball out of the park with those issues featuring the classic version of the characters, and I enjoyed all the behind-the-scenes sketches that Shaner has posted, too. DC really should give that pair (along with colorist Jordie Bellaire) the blank check for more Captain Marvel material; it would be a much better investment of time and energy than anything “New 52 Shazam”-related! Tags: Cameron Stewart, Captain Marvel, Evan "Doc" Shaner, Jeff Parker, Jerry Ordway, Marvel Family, Shazam! I’m in a deacquisition mode with my comic collection these days, trying to thin out an overgrown collection and focus on those titles and items that really mean a lot to me. Sure, I have a nearly-complete Hulk collection that stretches back to 1968, but am I really going to reread those comics? Especially when the Essentials take up so much less shelf space, and at the same time fills in the missing issues from ’68-’73? Gooch #1 (Bookish Beasts, 2014), the latest collection from Tara Avery, compiles 48 strips starring the bisexual title character. While I had read a number of these online, it was great to read them in one sitting. In addition to her expressive, well-drawn characters, Tara has a real knack for dry humor and snarkiness which makes it fun to spend time with these characters. Especially enjoyable was the sequence where Gooch and Miguel set up Luddite bartender Martha with blogger Gretchen! Tales of Amnesia #1 (Virtual Infinity Comics, 2014) is brand new from Kansas City’s own Mike Sullivan. While it introduces a lot of new characters and concepts (as is to be expected with a “backstory of the universe” kind of comic), there are enough dynamic layouts and action sequences that it reads like an actual story and not just an encyclopedia entry. Mike also notes where it (along with his “There’s something happening in Crawford, Kansas” webcomic) fits into the larger tale he’s been telling via short comics and anthology stories since 2004. Daniel Spottswood‘s NIX! 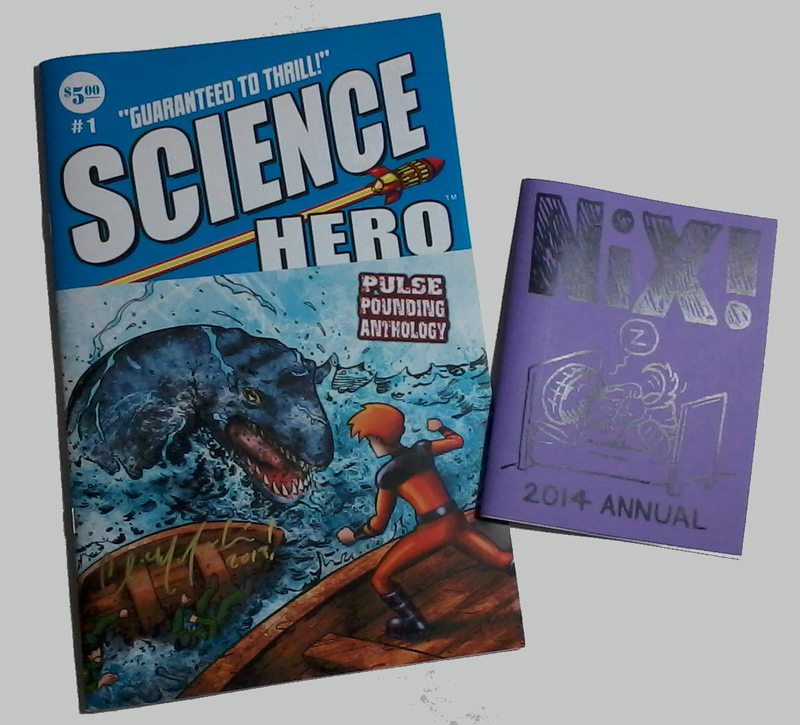 2014 Annual (the author, 2014) is a fine little minicomic. Unlike some of his previous print work I’ve picked up, this is a less physically involved (think Chris Ware) product, and more slice-of-life vignettes (think James Kochalka). He’s still able to pack a lot of character and expression into his small panels and even smaller characters, and this issue includes his foray into Hourly Comic Day 2014, a comic-making marathon even I wouldn’t want to attempt! Darren Neely’s weird science epic The Prospector #1-4 (the author, 2011-2013) jumps around in time and setting quite a bit–the author compared its multiple takes on the same events to “Lost”, which is an apt analogy. I’m of mixed mind on this effect: on the one hand, it gets tedious to jump back and forth between the same couple of scenes as they move slowly forward ; on the other, it’s a clever way to break up what could be long talky sequences with moments of action. The artwork by Chad Kaberlein & Philip Burnette improves over the issues, and issue #3 starts off particularly strong. Neely handles the lettering & coloring chores for these nicely-produced full color issues (his coloring includes a nice mottled texture that never overpowers the line art), which seems like a good way for him to exert final control over the finished product. Oh, Comics! 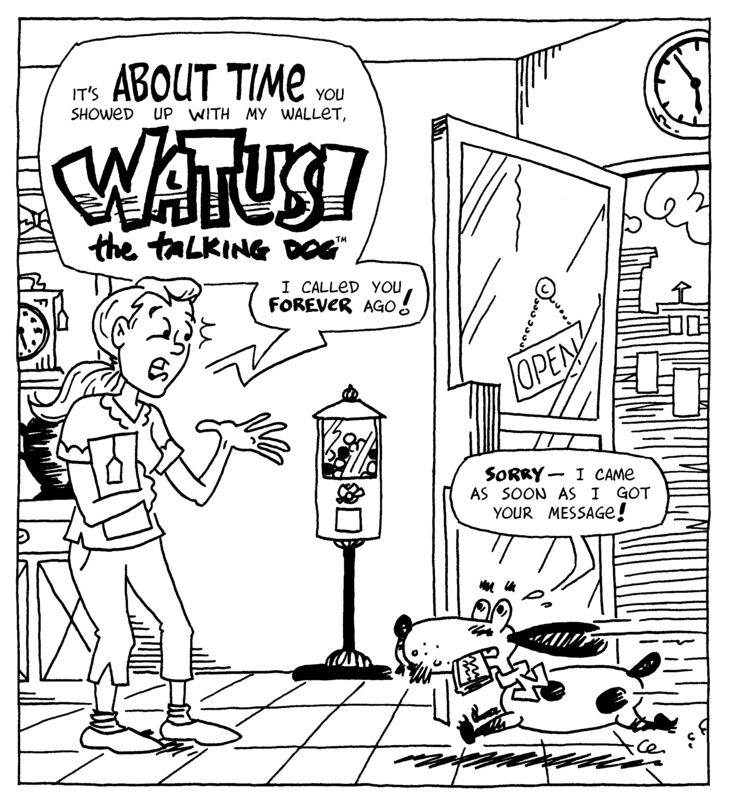 #22, the “Time” issue features a new four-page Watusi comic. One of the things I want to do this year is take advantage of anthology opportunities and local art shows, so publisher Bob Corby’s deadline reminder came at just the right time, since it gave me a chance to see how my work measures up in context to that of my peers, including Pam Bliss, Matt Feazell, Kel Crum, and Matt Levin … and I was happy to see I’m holding my own! You can get more info about– and order– this classy trade paperback from Back Porch Comics here. I may not have been able to attend SPACE, but it felt good to be connected to it vicariously thanks to this book! Keith O’Brien released his latest Samurai Slate collection, “Pungent, or, Starting With a Clean Slate”, on Free Comic Book Day, and it features a one-page story of his I drew. Keith’s writing on this character packs as many puns as possible into a minicomic page, and I find them challenging (in a good way) to draw. Once again I find myself in stellar company, including Batton Lash, Brad Foster, and cover artist Tom Cherry. Find out how to get your own copy from Keith at The Forbidden Falls Kourier.